I am always impressed by the detailed analysis of the TV financial commentators about yesterday’s market action. But then I remind myself that it was yesterday, not today or tomorrow. I read a lot of articles on forecasting, admittedly a difficult task. But there are some forecasts that are better than others. Recently, an attempt to forecast the lows in a popular stock was based on comparing the relative position of that stock to a long-term moving average, then doing the same for SPX. By matching the declining price pattern and subsequent recovery, we are to expect the next similar pattern to be a profitable signal to buy the lows of the stock. It doesn’t pass the smell test. But there is an important lesson to be learned. History matters, but what it tells you is very general, not specific. It paints a big picture. You can torture the data until it tells you what you want, but that won’t be what the future will bring. As an example, let’s say that an investment broker wants you to put money into a buy-and-hold program focused on the Dow Industrials (DOW). You want to know what to expect for returns, and for risk. The broker says, “Let’s look at the last 10 years, which includes the 2008 financial crisis. That should be as bad as it gets.” Is that true? 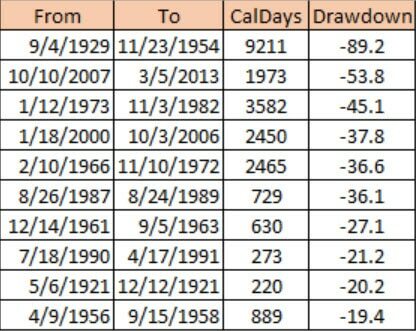 If we collect all drawdowns from 2006, which means the largest retracement from each new high (in percent), we have 73 occurrences with an average drawdown of 2.29%. Not bad. I could trade that without ever worrying about a sustained loss. Even better, the median loss (the value in the middle of the sorted table of drawdowns) is only 60 basis points (0.60%). The difference between the average and median values is the skew. When the average and median are not the same, there are some large numbers hiding in the bushes. When the average is smaller (more negative) than the median, the numbers are skewed to the left, indicating some large losses. Chart 1 shows all of the drawdowns since 2006. Chart 1. 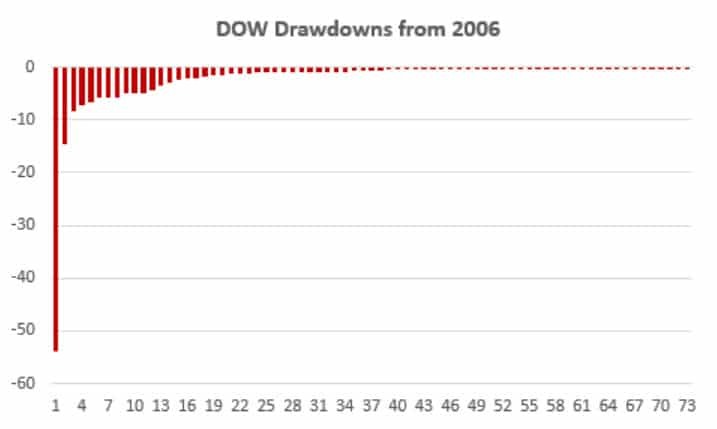 All drawdowns in the DOW from 2006. The median of -0.60 is located over the x-axis value of 37. The average includes the large drawdowns to the left, the biggest being 53%. Neither the average nor the median tell you what might happen. What’s the Chance of Another Large Drawdown? Statistician’s express everything as a probability, because contrary to some prescient forecasters, they admit that they don’t actually know what will happen in the future. Unlike Long Term Capital Corp, which removed the largest drawdowns from their data history, explaining that they would never happen again, we will keep those losses as part of the past performance. To get the probability of a large drawdown we calculate the standard deviation of all 73 drawdowns, getting a value of 6.6%. Theory says that there is a 2.5% chance of losing more than the average drawdown minus 2 standard deviations, that is, -2.29 – 2 x 6.60 = -15.5% over the period of time covered by the data. The 2008 loss of 53% is still far bigger. Again, theoretically, there shouldn’t be any losses greater than 3.5 standard deviations, so the maximum loss would be -2.29 – 3.5 x 6.60 = -25.4%, still only half of the real loss. What’s wrong with statistics? Let’s say we invested in the DOW over the past ten years based on the idea that the 2008 financial crisis was the worst we could see. Is that true? Let’s go back further, because it’s all about how much history you look at. Since 1920 the 100 largest drawdowns are shown in Chart 2 and Table 1. These numbers show a pattern very similar to Chart 1, just larger. 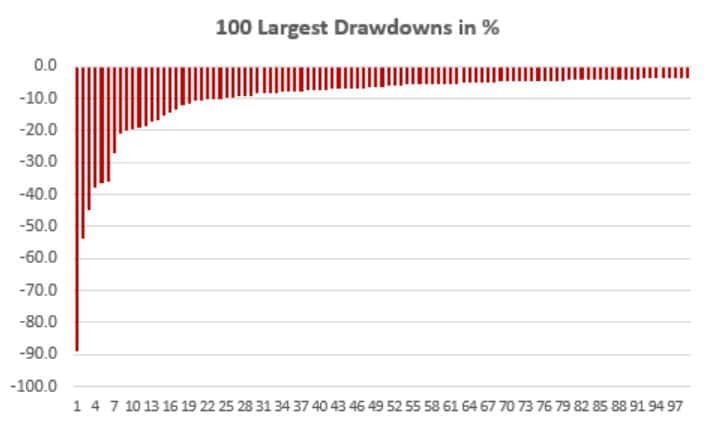 But the average of all drawdowns is only -2.56 and the median -0.86, showing that small drawdowns still overwhelm the big ones. Chart 2 (top) 100 Largest drawdowns in the DOW. Table 1. 10 Largest drawdowns. A rule in statistics is that, the more data you use, the larger the runs of good and bad numbers. It’s the same as coin flipping. If you flip a coin 64 times (it’s easier to calculate in powers of 2), you will only get one run of 4, either up or down. If you double the number of coin flips, you increase the likelihood of the longest run by 1, so that 128 flips will give a run of 5, and 256 flips will give a run of 6. This applies equally to stock prices. The more data you use, the longer the bull and bear moves, the larger the runs of profits and the larger runs of the losses. And, it applies to price shocks. While it’s not likely we will ever see a loss greater than the 89% of 1929, we can see more large losses compared to the ones only shown in the 2006 to 2016 data. Many investors choose to invest in a simple macrotrend (long-term) tactical system rather than the traditional buy-and-hold. Are they better off? Does a trend strategy reduce the drawdowns, and how do recent drawdowns compare to the longer history? A 120-day moving average. This qualifies as a “macro” trend and smooths out the erratic price movements. Enter a new long position when the trend turns up (the current trend value is greater than the previous value). Exit the long position when the trend turns down. There are no short sales and no costs applied. Position sizes are determined by an investment of $100,000 divided by the current price at the time of a new trade. This is an approximation of volatility parity, where each trade has about the same risk and the entire investment is always used. It prevents more recent trades, at higher prices, from overwhelming the results of older trades and gives a fair representation of performance over time. These rules will be applied to the DOW from 1920 and from 2006 and the results compared with each other and with the buy-and-hold results shown earlier. The charts below show the drawdowns of the trend method for the same periods, 1920 and 2006 to the present. Two points are worth noting. The largest drawdown from 2006 is about 33% compared to the buy-and-hold drawdown of 53%. The largest drawdown from 1920 is about 46% compared to the buy-and-hold drawdown of 89%. Chart 3. (left) All trend drawdowns from 2006, and (right) the 100 largest trend drawdowns from 1920, all trades are long-only and results are expressed in percent. Then the trend system drawdowns are bigger as we go back in history, but about 40% smaller than the buy-and-hold results. Even if we say that trend trading is more consistent, the time period selected to show the results is always important. Trend trading can’t have only upside and no downside consequences. It’s just not the way life works. There is always a trade-off. Let’s look at the results in more detail. In the table below, we can see that from 2006 the risk of trading a trend is higher than the buy-and-hold approach. The standard deviation, which represents volatility, is 22.7% compared to 18.1%, even though the drawdown for the trend method is far smaller. That means there are more times when the trend is wrong and fights with the market, something that can irritate an investor watching the daily price moves. Table 1. Comparison of buy-and-hold (BH) and moving average (MA) statistics for the periods beginning 2006 and 1920. The cost of smaller extreme drawdowns is that, in the long term, buy-and-hold has a larger return, 5.96% compared to the trend of 4.69%. And, the average and median drawdowns of the trend method are larger. Even though you may like the much higher trend returns for the past 10 years (9.47% compared to buy-and-hold of 4.62%), the long-term picture is likely to win over time. Personally, I prefer a little less return if I can reduce my drawdowns by 40%, increasing the reward to risk ratio (“Ratio”) significantly. Very large drawdowns can be extremely stressful, and many investors will close out their accounts before the market, and their losses, recover. So much the better when the 2006 returns are higher, but I don’t count on it.